So, this isn’t the first time I’ve incorporated cookie dough in to a cake. The first time I did it, I put a layer of just baked cookie dough at the bottom of an alternating chocolate and vanilla layer cake with salted caramel frosting. That was a great cake. 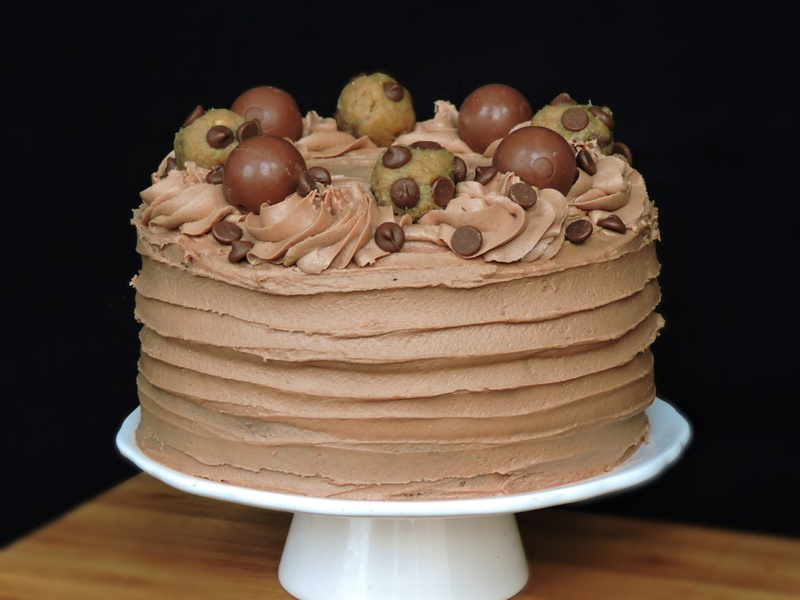 This time I thought I’d try something different… I baked cookie dough in to the chocolate cake layers. Sounds plausible right? I’m quite happy with the way it turned out actually, and if i were to do it again I’d only make the cookie dough chunks slightly smaller. The whole thing was held together with the SMOOTHEST nutella frosting you can imagine. It was like a cloud made out of nutella. 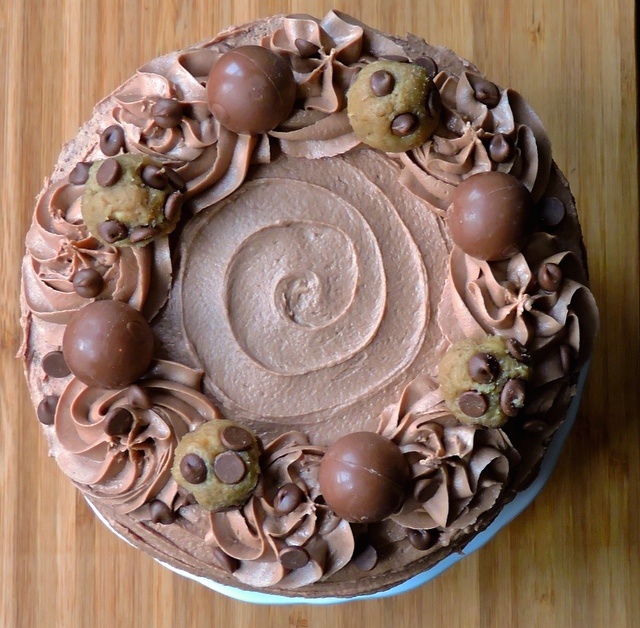 It added a nice dimension to the cake, though if you’re not in to much sweetness then perhaps make a swiss meringue buttercream which would also go really well with this cake. I made this for my housemate’s birthday. Well, belated birthday (his birthday was on the 1st Jan but oh well). I don’t think I’ve ever made two cakes that look the same and there are probably a couple of reasons for this. First, I like to tailor my cakes to the individual, what they like and how they like it so it’s really THEIR cake. Otherwise it’s just any old cake and it’s not as personal, you know what I’m saying? Secondly, I really don’t think I can recreate cakes – I completely wing it most of the time so an exact duplicate would just never happen! I definitely don’t have a signature cake flavour or filling but I do think that after all this time I’ve developed a style. I hate fondant. I hate working with it and it tastes horrible so I always work with some kind of buttercream or frosting. It’s all well and good having a massive cakes that looks amazing but what about taste? For me it’s all about the taste. Taste > Style. I’ve had a really hectic first few weeks back at uni this term, soooo many assignments (8,500 words worth WHAT)! After handing in my last one on Monday, I had to take a step back and sleep for about 12 hours and only then did I start feeling like myself again! Naturally, the second thing I did was bake. I wanted this cake to have a rustic kinda look but still have a bit of a wow factor and personally, I think it did just that. So far, all my housemates agree! I didn’t deviate too much from a normal chocolate cake, bar the whole cookie dough distraction so it was really simple to make and from start to finish only took about 2.5 hours. Considering I only have one 7in cake tin, I was pretty impressed with that kind of time! I’ve called this post ‘Chocolate Chip Cookies Part One’ because I am a sucker for trying new cookie recipes. 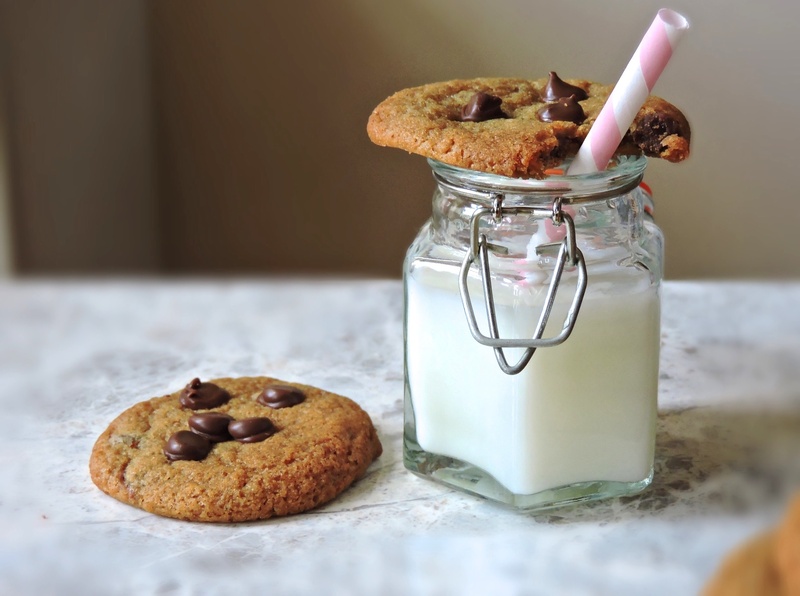 Depending on the type of cookie you want you have to alter the ingredients so multiple recipes are necessary to have a wide range of cookies in your repertoire! This recipe gives soft cookies. Soft, chewy, flat, and pretty much a complete dupe for Millie’s Cookies. 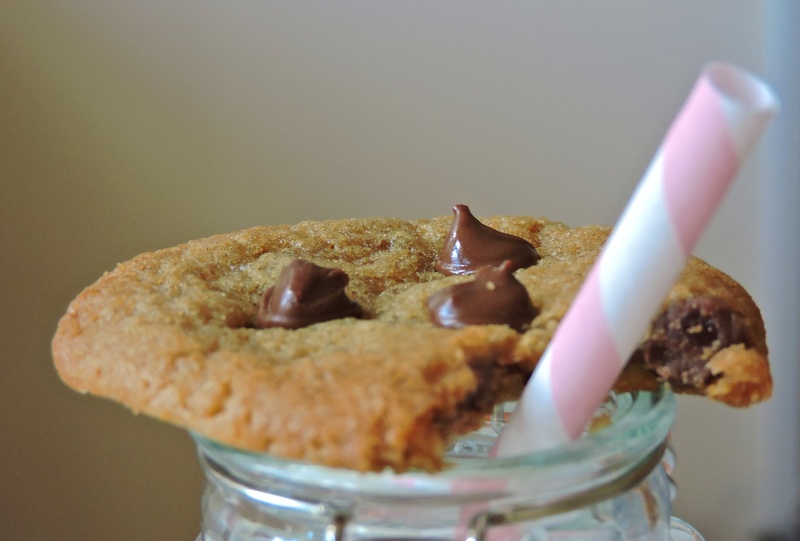 They’re super easy to throw together but as with all cookies, an electric mixer (handheld or standing) for creaming the butter and sugar properly is definitely helpful. This recipe makes a lot of cookies, I’d say half it if you don’t want to make that many but really, there’s no need. Make the dough, roll it in to balls and freeze it so that you can have fresh cookie goodness whenever the craving might arise! The title rhymes. You know it’s gonna be good. So just before I went to sleep last night I saw two overripe bananas on the kitchen table and subsequently dreamt about banana bread. It was the first thing I made this morning, before I even had a cup of tea. Don’t underestimate the power of dreams. So me being me, I couldn’t make plain banana bread. I looked around for some inspiration and saw the caramelised biscuit spread staring at me in the pantry. Sigh. This stuff is like legal crack. I found a pretty simple recipe online because my newly awoken state couldn’t manage to think of one to put together.